Offer supplemental feed or treats to your purple martins with the S&K Feeder Tray. This sturdy tray holds a generous amount of cooked eggs, mealworms, crickets, or eggshells, for a healthy colony. A triangular hole in the center of the item allows it to slide over your existing S&K Telescoping Aluminum Pole and Ground Socket, 15' (not included), or may also attach to a 1.25" outer diameter pole. The unit is also made to sit atop the S&K Predator Guard and act as a further deterrent to snakes or raccoons. 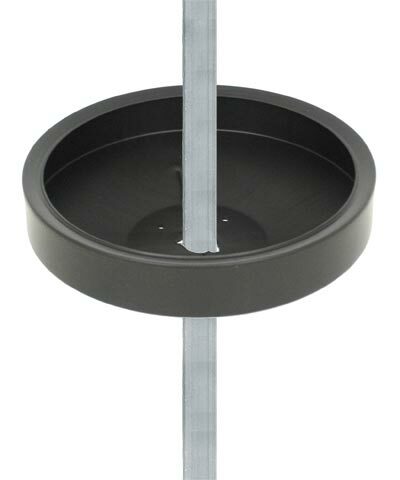 The 12.75" diameter dish holds up to 5 quarts of feed, and the black color offers a timeless appeal. Crafted of sturdy plastic, this tray will certainly last for several seasons. Help martins thrive by offering them feed in this Feeder Tray. Made in the USA. Capacity: 5 qts., 7.5 lbs.